JetBlue is again expanding and diversifying its flying schedule in Havana with new service from Boston and more flights from Fort Lauderdale. 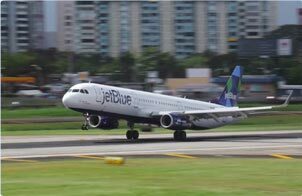 New England and South Florida nonstop service, combined with JetBlue’s existing nonstop service from New York and Orlando, means JetBlue will link Cuba’s capital with four American cities – more than any other U.S. airline. 12:30 p.m. – 4:30 p.m. 5:30 p.m. – 9:14 p.m.
Havana will be the 68th destination served from Boston and the 17th international city. No other airline serves as many domestic or international cities at Logan. The added flights at Logan advance JetBlue’s plan to grow its leadership position in Boston. The airline plans to reach 200 daily flights in the coming years and already operates more than 150 daily flights. 3:08 p.m. – 4:30 p.m. 5:30 p.m. – 6:43 p.m.
Flights between the U.S. and Havana feature the most legroom in coach (b) and complementary and unlimited name-brand snacks and soft drinks. Select flights also feature free Fly-Fi, the fastest broadband internet in the sky (c); free, live DIRECTV® programming and 100 channels of SiriusXM® radio in every seatback. JetBlue is proud to offer customer-friendly baggage allowances for travellers flying to or from Cuba, with the ability to check up to a total of three bags or boxes, each up to 99 lbs. and up to 80 linear inches (length + width +height) (d). Please see JetBlue’s Checked Baggage page for more information. All U.S. customers travelling to Cuba must be authorized to do so under the U.S. government’s Cuban Assets Control Regulations and they must certify that they qualify for one of the twelve approved travel categories outlined by the U.S. Department of Treasury. All travellers to Cuba must make their own determinations with respect to the appropriate travel category, as well as the type of visa required by Cuba for their purpose of travel.